A very rare light pillar was captured on the night of February 13/14, 2018 by the Gemini skycam facing south from the top of Mauna Kea in Hawaii. Frankie Lucena who was checking the skycam came across this rarely seen event in this part of the world. Blue Ray of Light Hawaii. Light pillars usually occur in cold climates, so to see them this far south is indeed very rare. 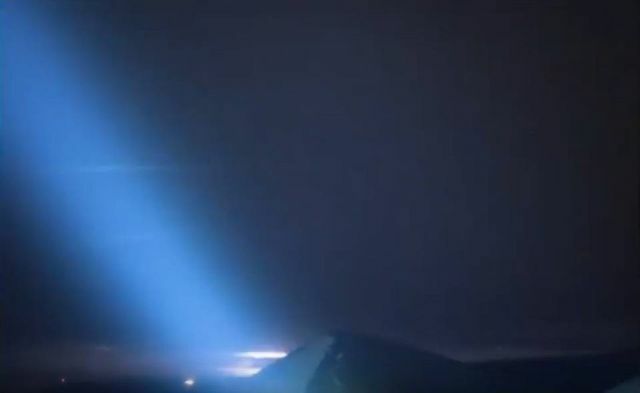 But not only the strange light pillar appeared over Hawaii, even stranger are the three blue rays of light that suddenly came out of nowhere. 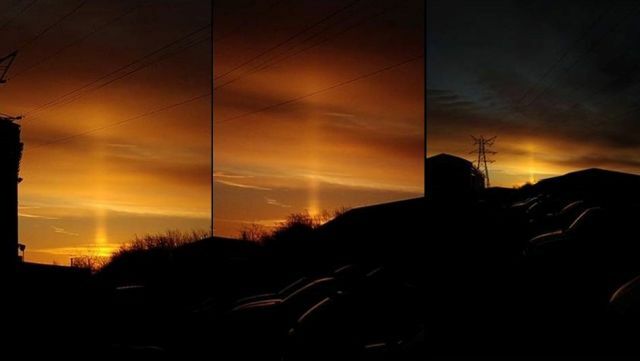 The rare light pillar in Hawaii could be a natural phenomenon, like the amazing light pillar at sunrise photographed by our reader from Coventry in the UK on February 14, 2018. Thanks. But what about the blue rays of light? Blue Ray of Light and Light Pillar Hawaii. Lightning, maybe but these blue rays of light are completely different from the specific lightning strikes as we know. Blue rays of light at 0.35 sec and 036 sec in the video.